How will Recruiters be Affected BEFORE GDPR Becomes Law? We’ve written and webinar’d a lot about GDPR – mainly to fill the gap left by the dull and boring ”we’re doomed” GDPR bandwagon jumped on by so many. You can watch our “thanks for making GDPR a GOOD thing” webinar and listen to my podcast with the knowledgeable Neil from Volcanic over on the Barclay Jones blog under the GDPR tag. What I want to focus on today is how recruiters and marketers may be disrupted by GDPR well before the legislation comes into effect. Plus I want you to think about how your candidates and clients may be “gearing up” for May 2018 too! And how you deal with them may help/hinder your reputation and pipeline. One crucial element of GDPR is that you need to demonstrate that you are compliant, not simply just be compliant. This means that you need to be educated, and educate your teams to understand the legalization and the resulting processes. So, something to do right away is to review the 3Cs (candidates, clients, and consultants) and how they can currently get in touch with you and ensure that their route into your business has been “tested” for GDPR questions. This includes any chat facilities you have on your recruitment website! I’ll go through a cheeky example of the sort of thing you need to “sort” way before May 2018. As part of the judging panel for the Marketing and Digital Recruitment Awards I was asked to review the websites of the finalists for the “Best Recruitment Website” category. Immediately the chat responded and said that they were “waiting for a consultant”. Then a lovely lady came online – with a name and photo – nice touch! GDPR for Recruiters: Shaken, but not Stirred? I had an image of what may have been going on in the office whilst this process was happening…. In any event, imagine I am a candidate with an axe to grind… or maybe just a candidate with a genuine question. 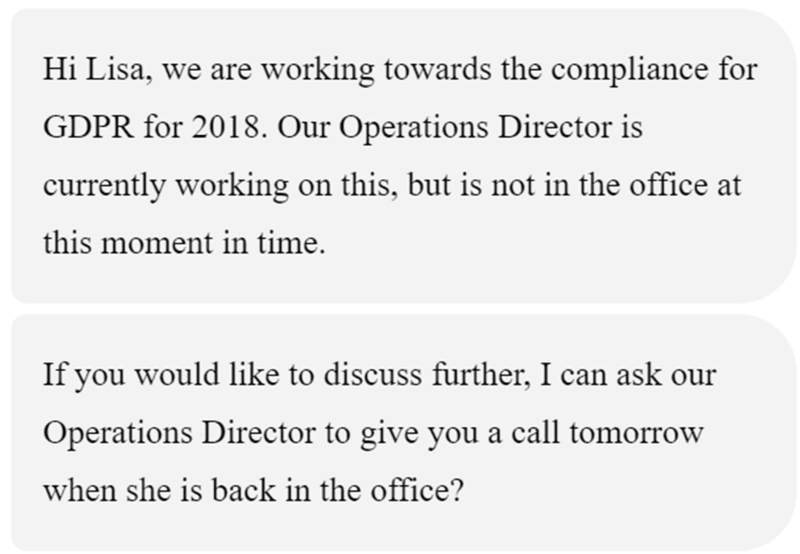 GDPR is such a big topic, as is candidate loyalty, candidate experience, “recruiters are crooks” etc… so I wonder if opening up chat facilities (and social media etc…) will just bring on more contact from candidates asking questions about recruitment (god forbid!). Don’t get me wrong, I liked the response – it clearly was human, but it definitely gave me an excuse to blog and gave me food for thought when I am working with clients on their marketing and GDPR strategies. Recruitment businesses – think about the messages you send through chat. Get some personality in there. Be ready for challenging questions. Be ready for people asking you about their data. And even if GDPR turns out to be a storm in a teacup, use this chance to really get to grips with genuine queries about personal data. You’ll get some genuine, loyal candidate fans… a recruiter’s dream!